If you’re from the North you will definitely know Greggs (maybe if you’re from the South, not so much) for it’s peach melbas, sausage rolls and stotties. Well, this time last year they opened up their first coffee shop called Greggs Moment on Northumberland Street in Newcastle. There was a big hoo-ha over it opening and lots of people flocked to see whether it lived up to the hype (including me and MrJ). In our opinion (and we’ve been twice! ): it’s rubbish. Our first time, we went to get some savoury food and sit down. I got a chicken and stuffing pie which turned out to just be an overfilled pasty in a take-away container. It wasn’t pleasant at all. The service was also pretty scatter-brained with one employee asking me if I’d like hot food and when I said ‘yes’ she said I just had to wait in the queue longer as she doesn’t deal with hot food! It was confusing on where to go to order certain things, and also where to pay! However, I liked the decor (MrJ didn’t – he thought they were trying to be too quirky and British) but I appreciated the bowler hat lampshades (although they did remind me of the villian’s side-kick in the Disney film Meet The Robinsons! ), the flying ducks on the wall and the teacup handles on the doors. We were disappointed that we didn’t love Greggs Moment (trying to support North-East businesses and all) and put this first-time disappointment down to teething problems as the cafe had not been open for very long. In July, we decided to go again. We had both come into town to collect our uni results and they had been delayed in being pinned on the noticeboard, so we had an hour to kill! We decided to pop into Greggs Moment and get a cake and some hot chocolate. Once again, there was confusion at the counter. Hot drinks can only be served by certain staff and you had to queue in different places depending on what you want. Why hasn’t this problem been ironed out yet? Also, the trays are hidden in a most bizarre place, so I feel sorry for the staff who have to constantly tell people where to pick one up from! We ordered a hot chocolate each, a rocky road and caramel shortbread. All were disappointing. I can’t put my finger on it, as usually Greggs desserts are so tasty, but these were just lacking in deliciousness. The decor still hadn’t grown on MrJ, so we passed the time away chit-chatting and slurping our hot chocolates until the fatal hour arrived when we could collect our university results. We passed! 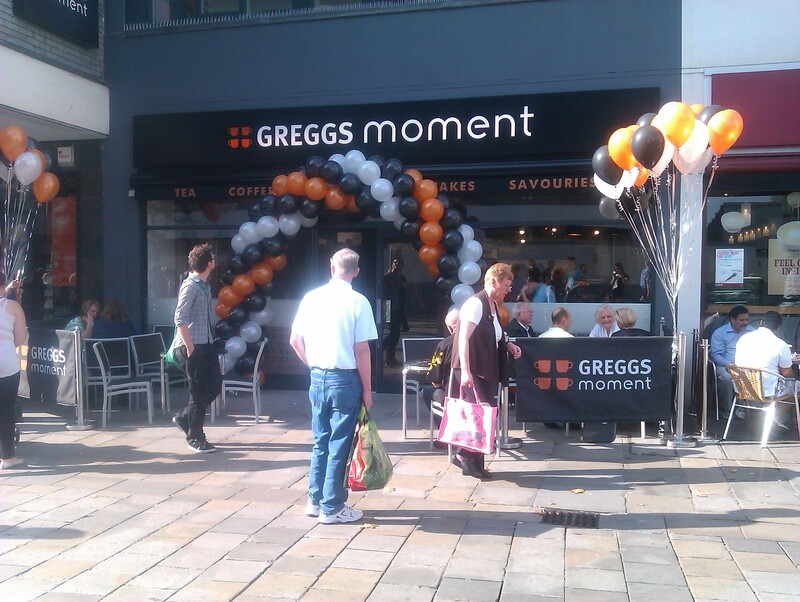 The Northumberland Street branch of Greggs Moment was a trial, to see how well received it would be by the Geordie nation. Since then, there has been another Greggs Moment open up in the Metro Centre, and also in Middlesborough.